The eastern end of Long Island has a rich history of architect designed beach houses. Located off renowned Dune Road, where most houses are many times its size, the site, known as a flag lot, is one of the last remaining of its kind, in that it is right on the ocean, riding the crest of the dune. Due to the constraints of the allowable building area, the house is located past the current allowable building line and replaces a dilapidated beach bungalow which was falling apart due to the crashing waves. The house is on a long, thin barrier island, connected back to mainland by bridges, allowing it to have views south to the immediacy of the ocean and north to the bay and marshland beyond. The client is a young family living in large apartment in downtown Manhattan. They arrive by car down a long drive and up an entry ramp over the natural dune landscape to a house that is rather small compared to their apartment. It is the opposite of most who have small apartments in the city and larger second homes to get away. Utilizing every available amount of square footage, and sited in the only location allowed by zoning, this compact 2200 sf, two story double wide typology home contains 4 bedrooms and a small office. Sitting atop a dune that was required to be rebuilt prior to construction, the main level communal space with its wall of floor to ceiling glass has the effect of sitting on the beach while within the house, but with access to all the comforts of home. 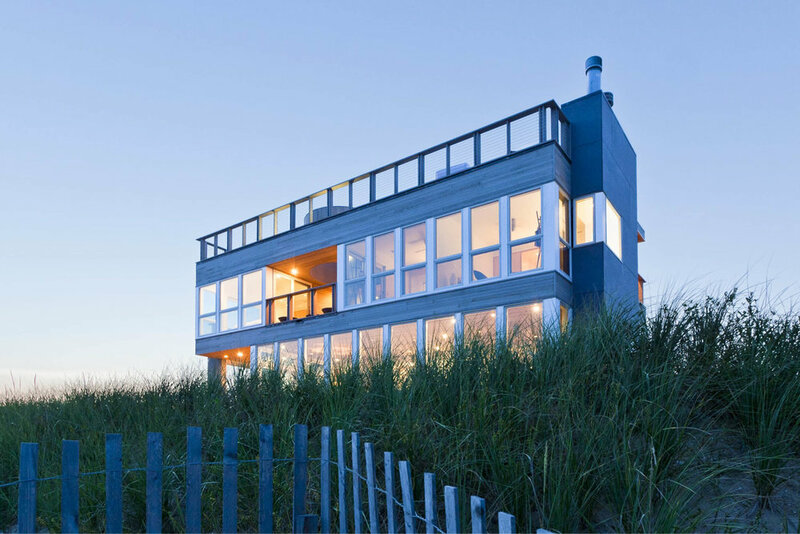 Atop the second level, which contains three bedrooms and a bunk room, interior stairs lead to roof deck with a fireplace, hot tub, space for morning yoga, and commanding views up and down the beach and over surrounding houses.